Officially one of the tastiest meals ever. It's probably so successful as it has all of those best ever flavours in it - coconut, lime, coriander, chilli, ginger. Yum. This recipe is dedicated to my best ever cooking friend Onni, as she was the one who introduced me to the name, to the dish and who taught me how to cook it. Onni is one of those, chuck everything in the pot and see how it turns out kind of girl, no measuring or weighing. It always turns out perfect for her though, slightly different every time, but every time tastes good! For those of you less that way inclined, I will provide you with a recipe, but please only use it as a general guide. Some ingredients can be left out, substituted, swapped or changed. Make it your own. Peel and chop the pumpkin or squash into chunks and then pop in a steamer until just going tender. Leave to one side. Finely chop the chillies, garlic, ginger, lemongrass, coriander and mint. The best method is to pop them in a blender together or use a hand blender for more thorough results, in order to get a paste. You can just chop them as finely as possible with a knife if you don't have a blender, the end result just isn't the same. Fry this paste up in a bit of olive oil in a deep saucepan. Don't let it burn - nobody likes black bits floating around in their soup! Add the coconut milk and stock and bring to the boil before turning the heat down and leaving it to simmer and infuse. Halve the cherry tomatoes and add with the lemon juice. 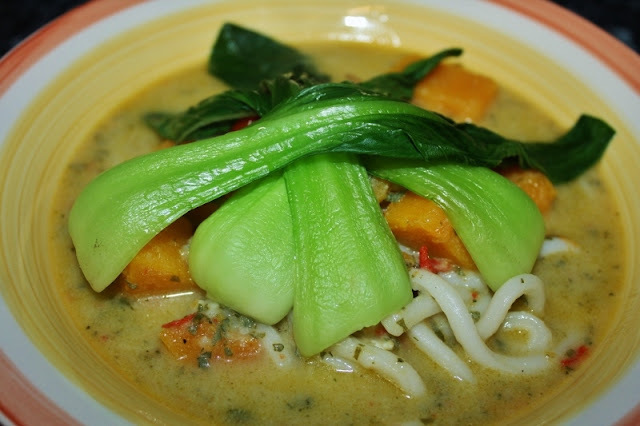 Add the cooked pumpkin or squash and cook for a few minutes before adding in some pre-cooked noodles or rice. So, as for making it your own....... sometimes I add rice noodles or glass noodles following the cooking instructions on the packet. Adding rice to soak up most of the liquid gives you a sort of Thai risotto, whilst adding less rice gives you a rice soup. As seen in the photo here, I have used udon noodles because they are my favourite and you can add them straight from the packet without the need for pre-cooking. Sometimes we also throw in whatever is lurking in the fridge and needs using up - half a can of chickpeas or a block of tofu, fried off until golden or marinated first in the paste mix. I have also put here some steamed pak choi because that's what they use in Wagamama noodle dishes and it's super yummy, not to mention good for you!